← Here we stand, before an obvious example of a pope the Holy Spirit would not have picked — except, perhaps, to help bring this Modernist crisis at last to a close by exposing it for the fraudulent Christianity it is. So no, we will not be silent. We will not give in to despair. We will, like the Vendeeans before us, stand firm against overwhelming odds, shouting our battle cry: Dieu, le Roi! God, the King! A chronic confusion seems to mark the present pontificate. The light of faith, hope, and love is seemingly absent, too often it is obscured by the ambiguity of Francis’ words and actions. This fosters within the faithful a growing unease. It compromises their capacity for love, joy and peace. 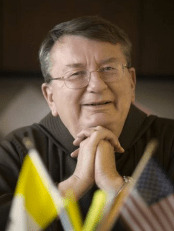 Thomas G. Weinandy is among the most eminent theologians and lives in Washington at the College of the Capuchins, the Franciscan order to which he belongs. He is a member of the international theological commission, the commission that Paul VI set up alongside the congregation for the doctrine of the faith so that it could avail itself of the cream of the crop among the world’s theologians. He has been a member of this commission since 2014, having been appointed to it by Pope Francis. Last May, while he was in Rome for a meeting of the commission, he got the germ of the idea to write an open letter to Francis, in order to confide to him about a disquiet that is not only his own but shared by many, over the growing chaos in the Church that he saw as having been caused to a large extent by none other than the pope. So bolstered by Heaven, Fr. Weinandy wrote the letter. He sent it to Pope Francis in the middle of summer. And today, on the feast of All Saints, he is making it public, on the American religious information portal Crux and right afterward in Rome, in four languages, on Settimo Cielo. Padre Weinandy, 71, has taught at numerous universities in the United States, at Oxford for twelve years, and in Rome at the Pontifical Gregorian University. He was for nine years the executive director of the secretariat for doctrine at the episcopal conference of the United States. First there is the disputed Chapter 8 of “Amoris Laetitia.” I need not share my own concerns about its content. Others, not only theologians, but also cardinals and bishops, have already done that. The main source of concern is the manner of your teaching. In “Amoris Laetitia,” your guidance at times seems intentionally ambiguous, thus inviting both a traditional interpretation of Catholic teaching on marriage and divorce as well as one that might imply a change in that teaching. As you wisely note, pastors should accompany and encourage persons in irregular marriages; but ambiguity persists about what that “accompaniment” actually means. To teach with such a seemingly intentional lack of clarity inevitably risks sinning against the Holy Spirit, the Spirit of truth. The Holy Spirit is given to the Church, and particularly to yourself, to dispel error, not to foster it. Moreover, only where there is truth can there be authentic love, for truth is the light that sets women and men free from the blindness of sin, a darkness that kills the life of the soul. Yet you seem to censor and even mock those who interpret Chapter 8 of “Amoris Laetitia” in accord with Church tradition as Pharisaic stone-throwers who embody a merciless rigorism. This kind of calumny is alien to the nature of the Petrine ministry. Some of your advisors regrettably seem to engage in similar actions. Such behavior gives the impression that your views cannot survive theological scrutiny, and so must be sustained by “ad hominem” arguments. Second, too often your manner seems to demean the importance of Church doctrine. Again and again you portray doctrine as dead and bookish, and far from the pastoral concerns of everyday life. Your critics have been accused, in your own words, of making doctrine an ideology. But it is precisely Christian doctrine – including the fine distinctions made with regard to central beliefs like the Trinitarian nature of God; the nature and purpose of the Church; the Incarnation; the Redemption; and the sacraments – that frees people from worldly ideologies and assures that they are actually preaching and teaching the authentic, life-giving Gospel. Those who devalue the doctrines of the Church separate themselves from Jesus, the author of truth. What they then possess, and can only possess, is an ideology – one that conforms to the world of sin and death. Third, faithful Catholics can only be disconcerted by your choice of some bishops, men who seem not merely open to those who hold views counter to Christian belief but who support and even defend them. What scandalizes believers, and even some fellow bishops, is not only your having appointed such men to be shepherds of the Church, but that you also seem silent in the face of their teaching and pastoral practice. This weakens the zeal of the many women and men who have championed authentic Catholic teaching over long periods of time, often at the risk of their own reputations and well-being. As a result, many of the faithful, who embody the “sensus fidelium,” are losing confidence in their supreme shepherd. Fourth, the Church is one body, the Mystical Body of Christ, and you are commissioned by the Lord himself to promote and strengthen her unity. But your actions and words too often seem intent on doing the opposite. Encouraging a form of “synodality” that allows and promotes various doctrinal and moral options within the Church can only lead to more theological and pastoral confusion. Such synodality is unwise and, in practice, works against collegial unity among bishops. 1 Response to A chronic confusion seems to mark the present pontificate. The light of faith, hope, and love is seemingly absent, too often it is obscured by the ambiguity of Francis’ words and actions. This fosters within the faithful a growing unease. It compromises their capacity for love, joy and peace. Francis won’t answer this Theologian even though he rambles about “Dialogue acceptance etc”. Some type of doublespeak from Francis or his crew will be the response to this.